In one of the better matchups on the Week 2 schedule, the Dallas Cowboys went into Denver and beat the Broncos on the road. In a game that featured an extended delay for lightning, the Denver Broncos played host to the Dallas Cowboys inside Sports Authority Field at Mile High on Sunday. The Broncos got off to a fast start before the delay, as Trevor Siemian hit Emmanuel Sanders for an early touchdown. 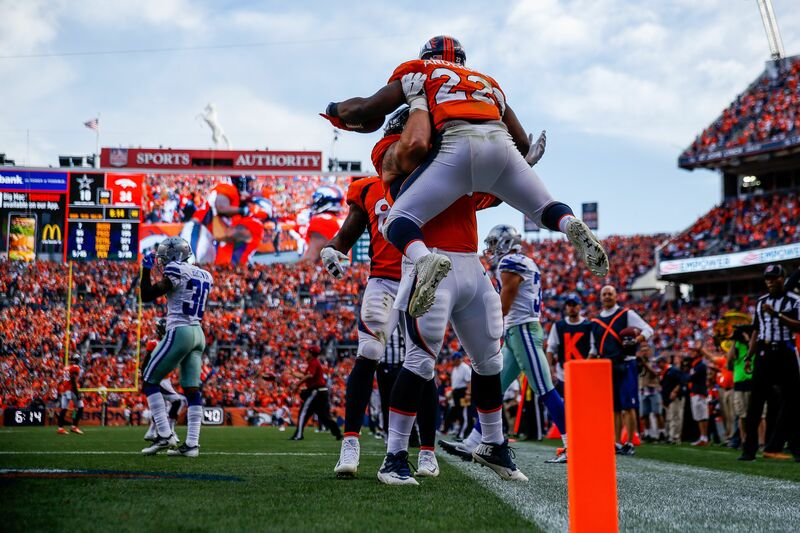 The teams traded touchdowns after the delay, but Siemian hit Sanders again with under two minutes left in the half to give the Broncos a 21-7 lead. The flurry of touchdowns before the half was really something to see. Dak Prescott hit Dez Bryant to start the second quarter, as the team capitalized off a sack and fumble by Siemian. However, Siemian hit C.J. Anderson for a long touchdown, which was mostly the work of Anderson, and then hit Sanders again prior to the half. This game was billed to be a good one, but it was the Broncos who proved to be the better team. By the time you could blink, the Broncos had taken over the game, and the two teams headed towards the fourth quarter with Denver up 35-10. Siemian shook off two pretty bad turnovers to throw for over 230 yards and four touchdowns. Dallas did score to cut the lead to 18 in the fourth, and then had a shot on a 4th-and-Goal inside Broncos territory. However, Aqib Talib picked off Prescott, taking all the way back to the house. For the Cowboys, it was a pretty bad road loss considering the momentum they had after beating division rival New York in Week 1. The Broncos got great production out of their running backs in this one, especially C.J. Anderson, who ran like a bull all afternoon. Denver became one of three AFC West teams to start the year 2-0, and the division is going to be one to watch all year long. The star wideout for the Denver Broncos had a big game on Sunday, catching six balls for 62 yards and a score. The veteran teamed with Demaryius Thomas to give the Broncos a solid one-two punch at the position, and helped Siemian to a career-high four touchdown game. If the Broncos pass the way they did against Dallas, they are going to be tough to stop. In a game that saw stars like Ezekiel Elliott and Dak Prescott play pretty pedestrian football, a seasoned veteran led the way for the Cowboys. Jason Witten hauled in ten passes in the game, including number 1,105, which put him in sole possession of fourth all-time in NFL history. Witten also scored in the game, showing that while he has slowed down, he is still a viable option in the passing game. Siemian had to beat out Paxton Lynch to earn the starting job this summer, and he is playing well enough to put Lynch even further in the rearview mirror. The third-year quarterback out of Northwestern threw four touchdowns in the game, setting a career-high, and looked very comfortable throughout. He may have found something special with offensive coordinator Mike McCoy. The Broncos were actually home underdogs in this one, as the Cowboys spotted them two points prior to kickoff. They must have been upset about that, because they ended up blowing the Cowboys out. The over/under was set at 42, mostly due to both teams having solid defensive units, but Denver nearly scored that many points on their own. All odds can be found at SportsBook Review throughout the week. The Denver Broncos will head East in Week 3, as they go to Buffalo to take on the Bills. Dallas will be on full display in primetime, as they play host to the Arizona Cardinals inside AT&T Stadium on Monday Night Football.